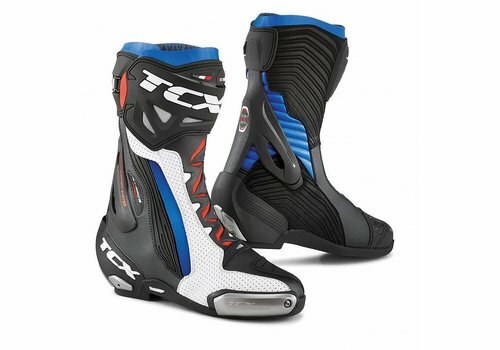 The TCX RT-Race Pro Air motorcycle boots are the absolute top model from TCX for the sports rider. 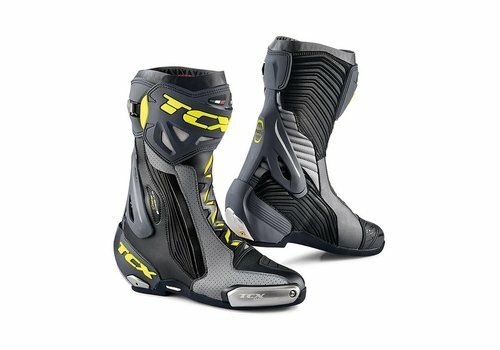 A lot of research and development is put into these sports motorcycle boots. The foot is encapsulated in a unique way by the boot and offers the ultimate protection. 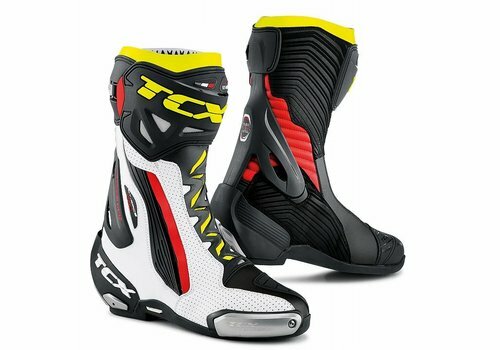 With the dazzling design of these sports boots, TCX once again shows that they are not inferior to Dainese and Alpinestars boots. 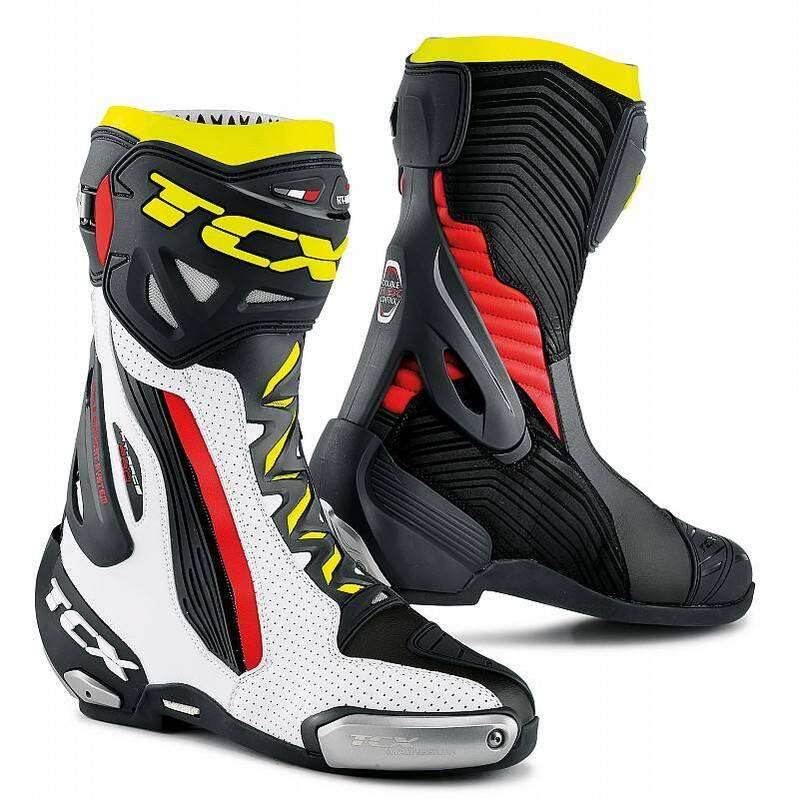 The Italian company TCX specialises in motorcycle shoes and motorcycle boots. At TCX they set high standards with regards to the safety of their products. In addition, the company also distinguishes itself with their high-quality Italian design. 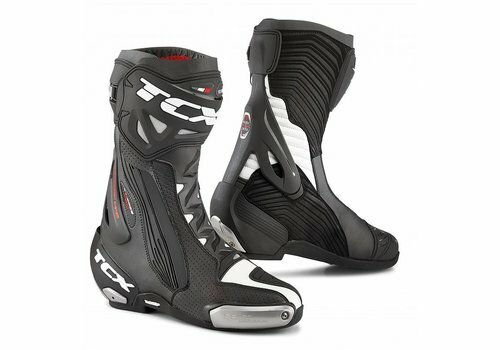 Their motorcycle boots are of excellent quality and TCX boots rank among the top boots in terms of quality. With the RT-Race Pro Air the company is taking a big step forward. The boots are also worn by world champion Johann Zarco in the MotoGP. Here the boots are subjected to intense conditions at the absolute top level. 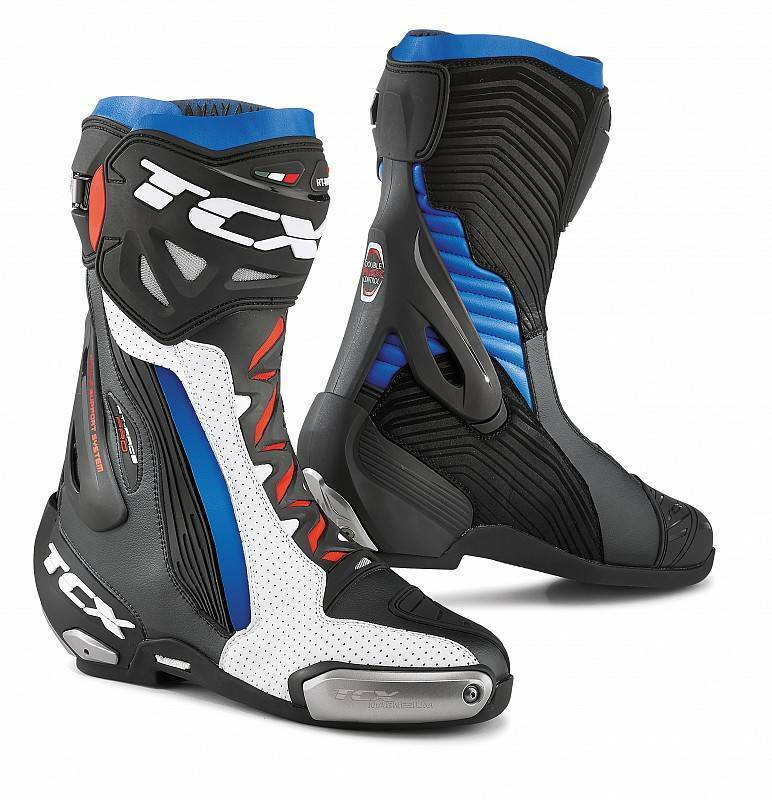 One of the competitors of the TCX RT-Race Pro AIR is the Alpinestars Supertech R. The Supertech R is the top model from the quality brand Alpinestars. It is a Race boot with a special inner shoe that provides optimal protection and comfort. Furthermore, high-quality materials have been used in the manufacturing of this boot. This boot has a recommended retail price of € 429. 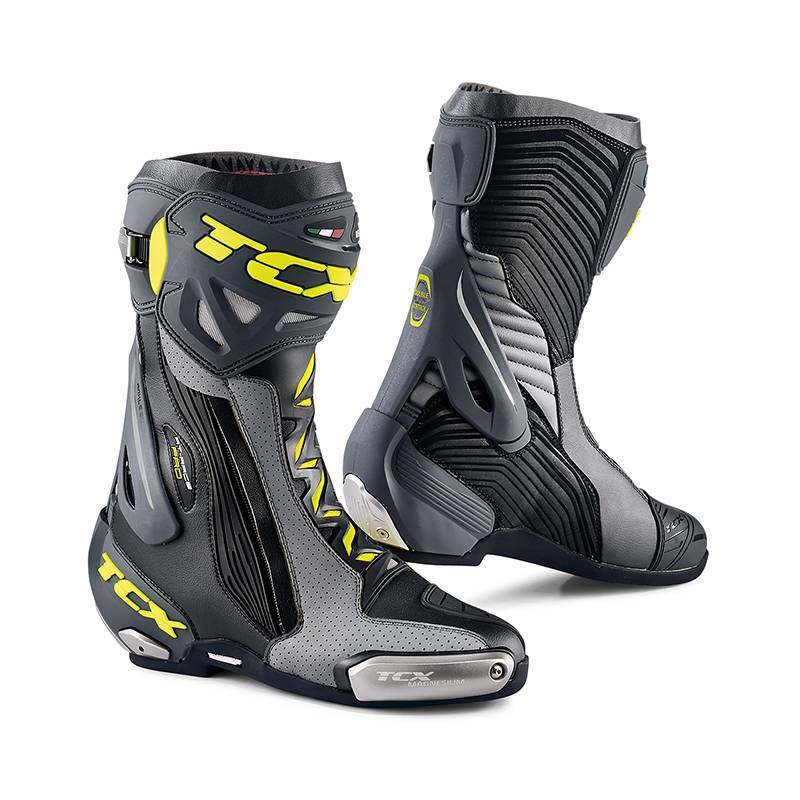 Another competitor of the TCX RT-Race Pro AIR is the Dainese Axial D1. This is also a boot from a quality brand, Dainese. The D-Axial system protects the ankle against twisting and this D-Axial system offers close-fitting protection on the ankle and the foot. In addition to protection, the Axial D1 offers unprecedented comfort. This boot has a recommended retail price of € 469. These boots are available at Champion Helmets for an excellent price. For an extra discount you can subscribe to our newsletter or You tube channel and immediately receive a free 1000 points Champion Cash worth € 10, -. Found it cheaper somewhere else? Let us know and we will price match and even try to beat the price. The boot is equipped with a Double Flex Control system. This D.F.C system of PU protects the ankle against overload and injury. It allows 13 degrees backward and 14 degrees forward bending. This allows for comfortable movement with the foot. This PU frame is thin and flat so you almost do not feel it. It provides superior protection in the case of impact. This D.F.C. (Double Flex Control) System does not cause discomfort and does not interfere with communication from the engine. There are air intakes covered with iron mesh in the PU shin plate. The heel also has a PU insert that is impact absorbing. Furthermore, the boot has replaceable, wear-resistant magnesium sliders on the side of the toes, the heel and on the back of the heel. These sliders facilitate sliding on this part of the boot and prevent damage to the boot. If you hit the asphalt with the sliders in a bend while driving, you can easily replace them and your boot is as good as new again. This boot has a rubber sole with double composition for extra grip. The newly-designed wear-resistant microfibre heat guard, offers the best grip on the bike and ultimate protection against the heat of the engine. Furthermore, the boot has a polyurethane shift pad that is integrated into the sole. This protects the boot against wear and gives optimal feeling when shifting. 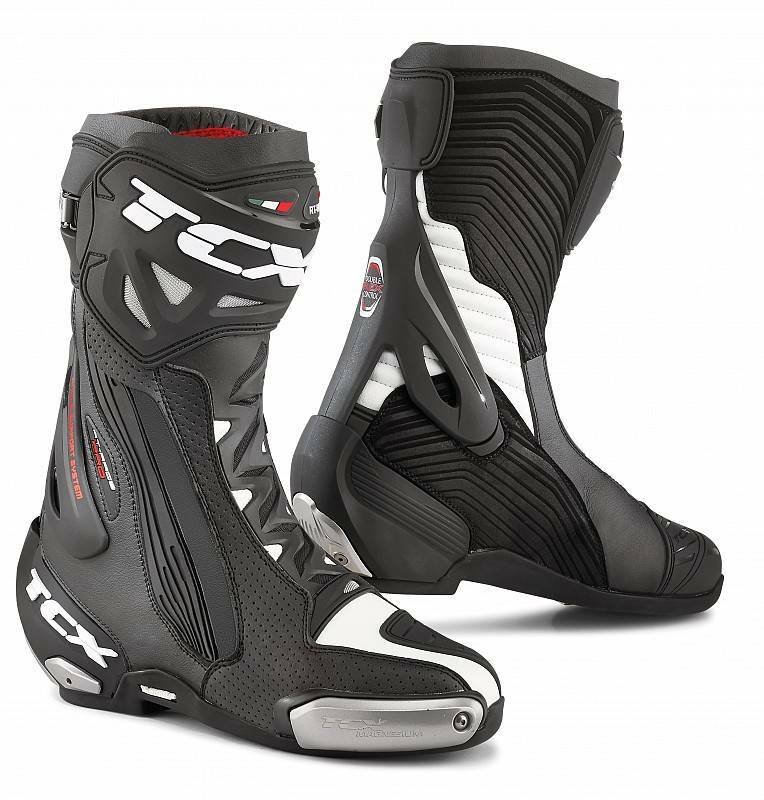 The Upper part of the RT-RACE PRO AIR boots is made of durable, lightweight and perforated microfibre material. The soft microfibre top of the boot provides a perfect fit around the calf. The TCX RT-Race pro air is lined with AIR TECH breathable, moisture-absorbent, quick-drying and soft-touch Mesh (woven polyester blended yarn). This padded rear flex area lining on the flexible back and in the tongue inside the boot is combined with double density foam for excellent comfort around the ankle. The over-injected front panel of the boot offers an easy entry and a nice fit. This is largely due to the large elastic zipper on the side with Velcro flap and the micro adjustable aluminium buckle, which is attached to the shin plate. This buckle is located on the height of the calf and since the thickness of the calf can vary widely per individual, it is very comfortable because the closure is adjustable and it has a soft microfiber gaiter for a precise fit around the calf. Furthermore, the internal lacing system, which wraps the foot, assures the rider of a perfect fit while riding. Thanks to this Fast Fit Control, the fit adapts to the foot of the individual rider. The footbed in the boot is anatomical, replaceable, breathable and extra light. The midsole is reinforced and has differentiated thickness. All of this contributes to the comfort while wearing these top boots. These boots were already available in 3 different colours: WHITE/BLACK/BLUE - WHITE/RED/YELLOW FLUO - BLACK. A fourth colour has been added: BLACK/GREY/YELLOW FLUO. Furthermore, these boots are CE certified. Seen it cheaper somewhere else? Let us know and we will price match and even try to beat the price.